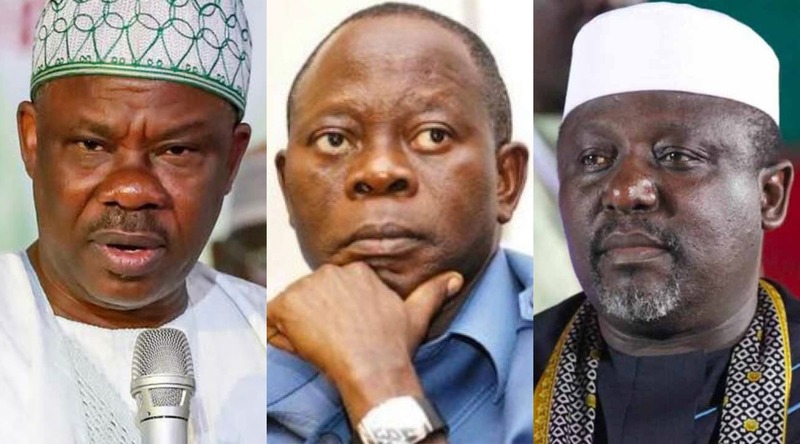 The primary elections crisis rocking the APC took a new twist this week when Adekunle Akinlade and Uche Nwosu, anointed governorship choices of the governors of Ogun and Imo states, Ibikunle Amosun and Rochas Okorocha, respectively, announced their defection from the ruling party to pursue their political ambitions elsewhere. While Akinlade along other Amosun’s supporters moved to Allied Peoples Movement, APM; Nwosu and others crossed to the Democratic People’s Party, DPP. However, reacting to the development on behalf of the party’s national leadership headed by Comrade Adams Oshiomhole, the National Publicity Secretary of the ruling party, Mallam Lanre Issa-Onilu told Saturday Sun that the governors’ men placed individual interest above party and national interest, stressing that the party will react appropriately in due course. His words: “APC as a party is looking critically at that development and in due course take a position on it. However, in the interim, we will continue to encourage our members not to be driven by selfish ambition but rather to be driven by higher ideals that the party represents. “Let me emphasis that what we have done was for the best interest of the party, government and the generality of people of this country. This has continued to encourage us to be focused. We will however take what happened into consideration and in due course react appropriately,” he said. On whether the exit will affect the party’s fortunes, he said: “The reality is that as a party, you can’t afford to lose any party member. But we also know that as some are leaving, many others are joining us. Regardless of what happened, I can tell you that the ruling party is very much secure. “To them I ask, what about the common objective of using the party as a platform to rescue the country from the dungeon that the PDP has thrown it. That would have been enough motivation to these members leaving the party. We implore them to think deeply and allow the national interest the party is championing,” he said. On whether the party will dangle olive branch, he said: “Reconciliation process has started with the setting up of the panel whose members have started working round the clock to pacify the aggrieved members from every part of the country. Miffed by the party’s response to the development, one of Amosun’s henchmen and Majority Leader of the Ogun State House of Assembly, Yinka Mafe condemned the Oshiomhole’s NWC comment. Mafe, who along with three other Ogun state lawmakers on Thursday, defected from the ruling All Progressives Congress (APC) to the Allied People’s Movement (APM), said he found it unbelievable that the national chairman of APC, Adams Oshiomhole, and members of the National Working Committee of the party, would say they would not miss their exit from the party. Mafe, who is now the House of Reps candidate for Remo Federal Constituency under the platform of APM added that the statement credited to the party’s leadership is unfortunate and unfair. He, therefore, challenged the national leadership of the APC to wait for a day after the elections in 2019, to fully know whether APC would miss those who have dumped it for APM and other parties. Also reacting, Director-General of Uche Nwosu (Ugwumba) campaign organisation, Hon. Chidi Ibe said that the claim that they would not be missed by the party is mere politics. The former state commissioner for Information said that the supporters and loyalists of Uche Nwosu have already concluded arrangements to leave the party for Adams Oshiomhole and Governor Rochas Okorocha. Hon. Ibe reiterated that if the party had wanted a genuine reconciliation, the national leadership of the party should have done the right thing which is to uphold the October 6, 2018 governorship primary election which was won by Uche Nwosu. APC is still keeping this fool. We know that they are regretting ever making this uneducated mad thief the chairman of their party.